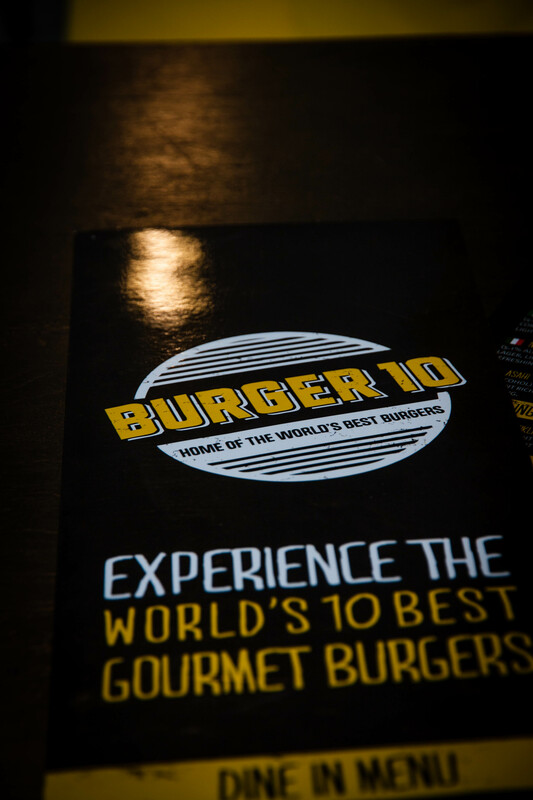 *Disclaimer: Bianca and Alex were invited to Burger10 by Sheryl Jaber and Chef/Owner Hussein Jaber. All opinions however are independent. Bianca: Hamburgers – A very humble product, generally consisting of two slices of bread or a roll, some form of protein be it a beef patty, a moist chicken breast. Throw in some lettuce, tomato, a slice of cheese and you have a meal. Sydney has been swept up in a burger revolution the past two years or so, with the opening of Chur Burgers, Bonarche Burgers, Mary’s and now Burger10 in Glebe. Having the opportunity to sit down and share a meal with Chef Hussein was a great way to pick his brain and go behind the makings of each individual Burger/Country representation. 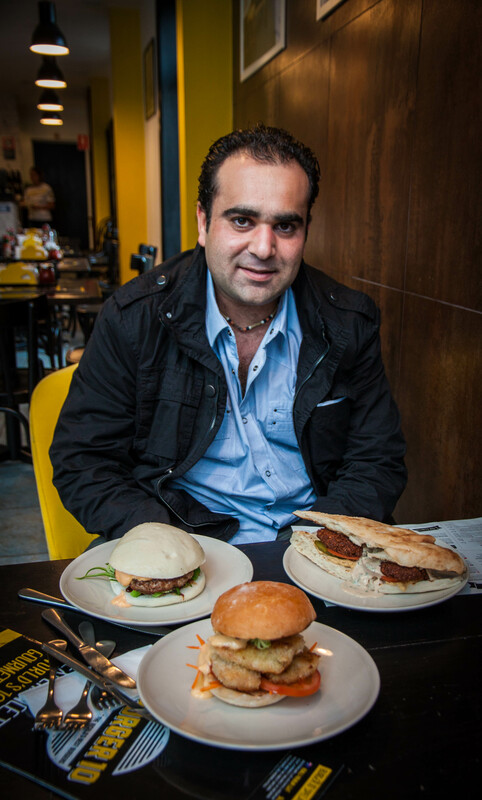 Hussein has had quite the illustrious career, working in numerous high end Hotels in the United Arab Emirates, an executive chef for Nestle and a senior chef at Luna Park before deciding to open Burger 10 in Sydney. Sitting down to lunch we sampled a number of items on the menu to get a broad taste of the burgers and sides. Having missed out on the ‘Classic Beef Burger’ the first time around due to a server error. I finally got to sink my teeth into the American representation. A solid tasting burger with all the elements working well together, I personally think this would have made a better ‘Australian’ burger than its current incarnation, but that’s just me. It was still a great tasting burger. Chef Hussein explained his reasoning behind the ‘Australian Braised Beef Burger’ – Classic burger bun, red wine braised grass fed beef chunks, shaved ham, mushrooms, sauerkraut, rocket, roasted garlic cheese sauce. This one stumped me upon first inspection which I mentioned in my prior post on Burger 10. His reasoning however, totally made sense. A play on the classic and popular Australian snack/meal – The Aussie Meat Pie. The ‘Falafel Burger’ – served on a Turkish Bun, spiced chickpeas & broad bean pattie, hummus, tomato, pickled cucumber, parsley & mint tahini was a fantastic Lebanese ‘burger’. Hussein, taken with a street vendor’s falafel’s when he was a young man tried to emulate the flavour and texture and said himself he was close. I can’t vouch for that but can definitely vouch for the flavour of that Falafel Burger. 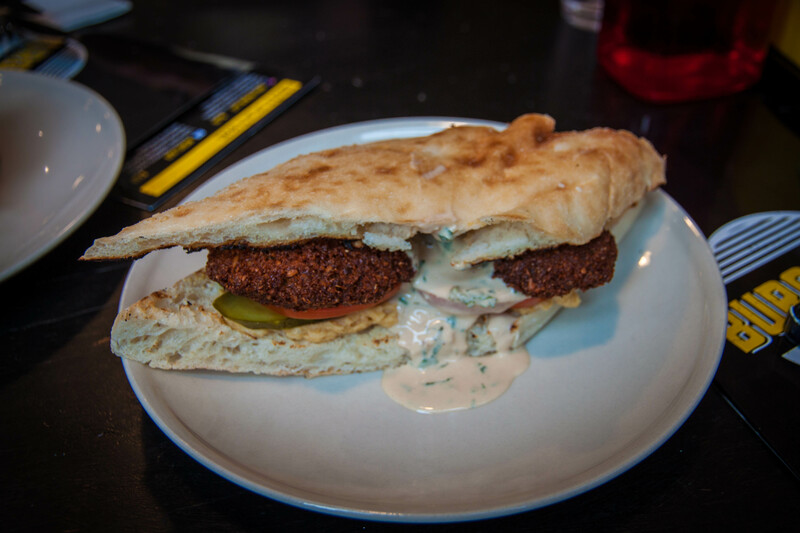 Serving the falafel patties on Turkish bread was a great touch to add that extra Middle Eastern flair. 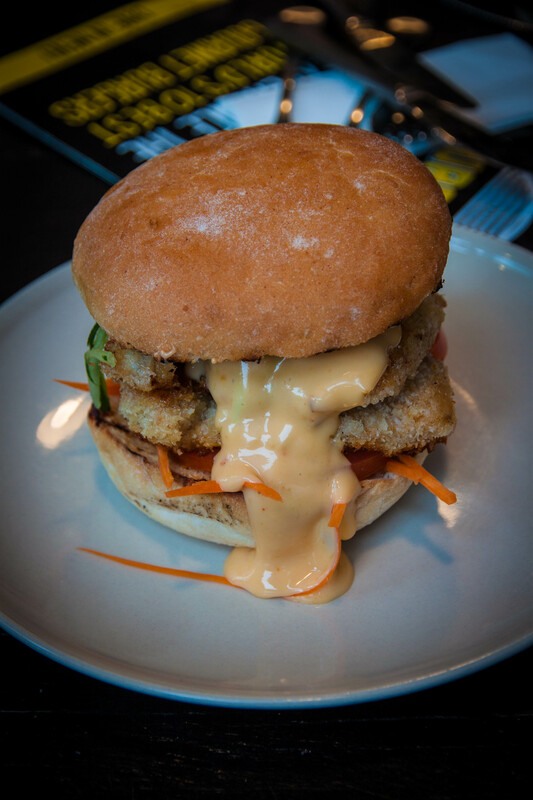 One of my favourites of the day, my first initial pick was the ‘Barramundi Fish Burger’ – Classic burger bun, coconut crusted red curry marinated barramundi fillet, satay sauce, cucumber, carrot, tomato, sweet chili & lime aioli. This was a knockout of a burger. The sheer number of ingredients working harmoniously together in this stunning hamburger are fairly impressive. Representing Thailand, the very light spice of the red curry come in to play to signify a very obvious traditional Thai dish. It plays very well alongside the peanut sauce, with the fairly light tasting cucumber and carrot shavings offset whatever heat there may be. 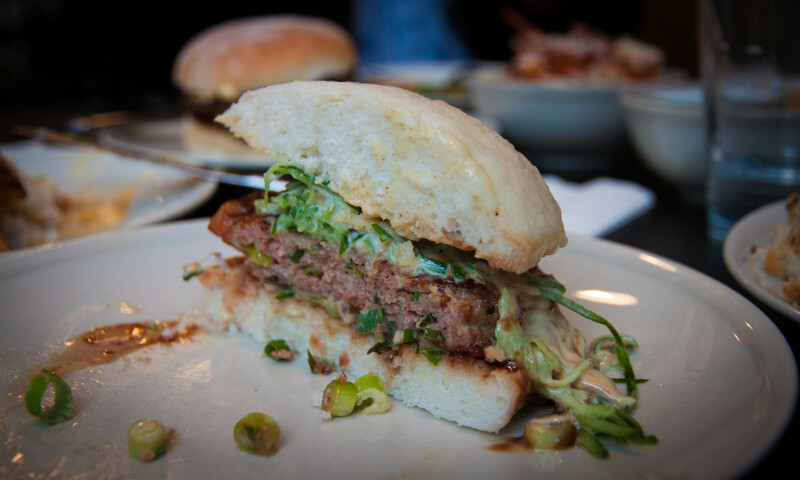 Our last burger of the day was the ‘Pork & Prawn Burger’ – traditional steamed bun, ginger shaoxing wine, marinated pork and prawn pattie, cucumber, green shallots, hoisin sauce & soy mayo. This turned out to be Alex’s and mine (followed closely by the Barramundi) favourite burger of the day. Which was quite the surprise, a very very odd flavour profile for a hamburger. It was an exceptionally clever and original burger. Drawing from traditional Chinese favourites Pork Buns and Dim Sums. 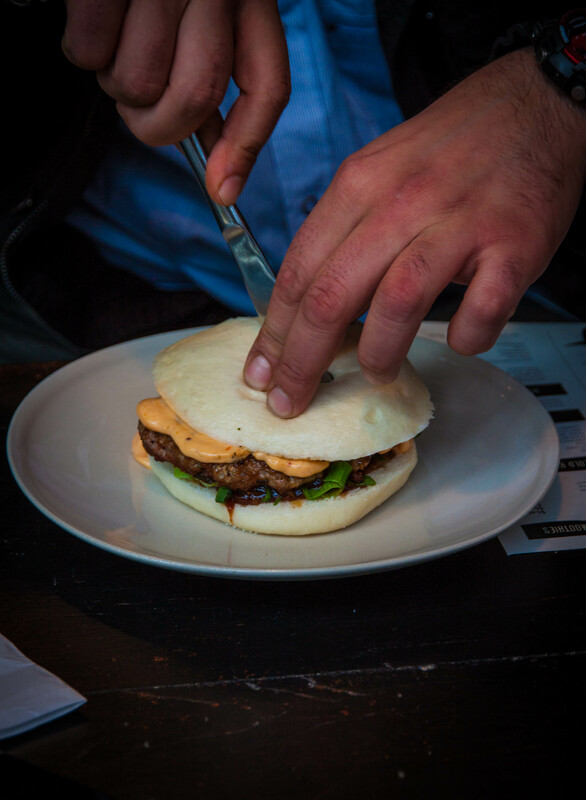 Hussein created a burger that tasted exactly like a delicious steamed Pork Bun. 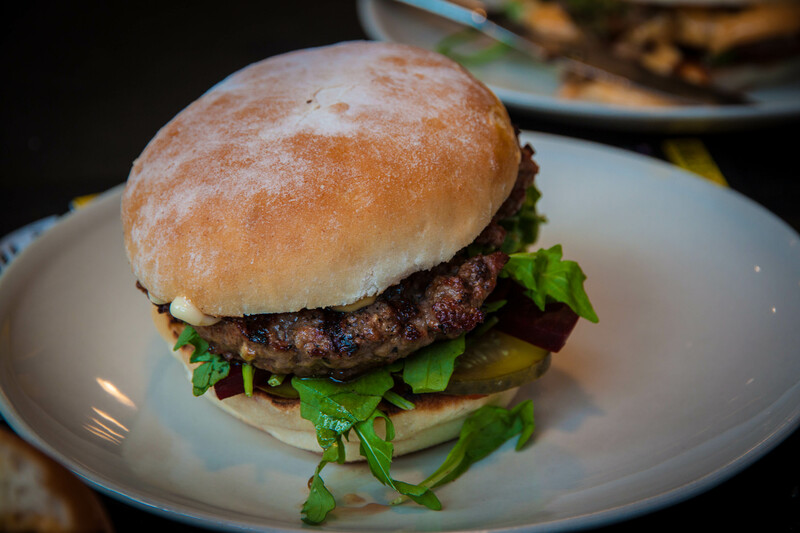 The bun was a stroke of genius, pillowy and soft and the patty incredibly flavoursome. Coming from two people that don’t particularly enjoy seafood. We also sampled the ‘Cajun spiced smoked crispy potato fries with Bacon & Cheese Sauce’. This could be the bellyful of burgers talking but the fries didn’t make much of a lasting impression. The Potato fries themselves were crunchy and fluffy, I had a bit of an issue with the cheese sauce and the bacon. Had the Bacon been crispy it would have added that extra zing to the fries but they were a little limp. 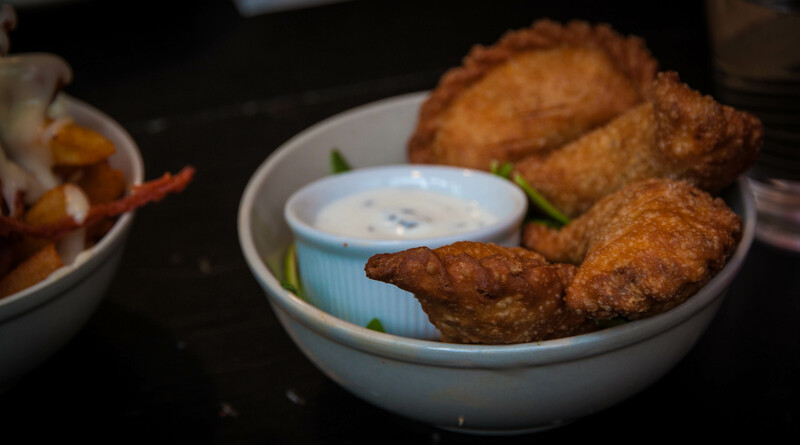 Playing on flavours from around the world, Hussein has combined traditional Latin American Empanadas with an Indian flavour profile. 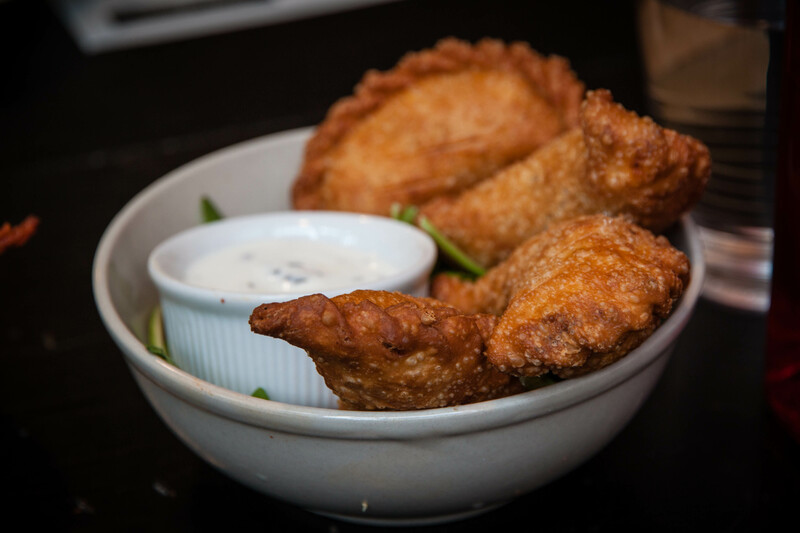 The scrumptious ‘Chicken Tandoori empanadas with minted sour cream’. These were a winner, had we not been busting at the gut from all the food, we may have picked up a serving for the car ride home. What was obvious from our chat with Hussein is that he takes his craft very seriously. 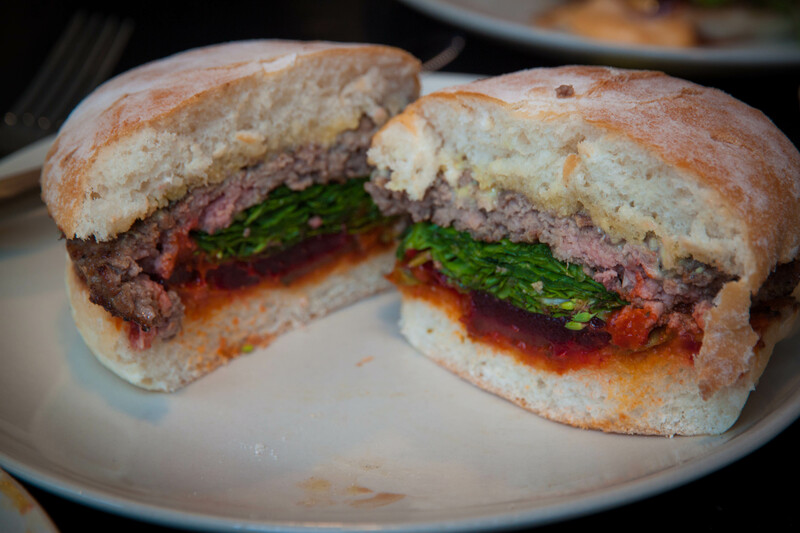 Each burger was trialled till the tenth degree, balancing ingredients alongside the traditional flavours. The plan is to eventually include Nutritional information to help patrons make the best choice for their particular situation. Down the track the plan is to integrate world cultural events such as the Olympics, the Brazil world cup with promotional Burgers a great chance to introduce some whacky burger combinations. Burger 10 also offer a limited Breakfast menu on Saturdays and Sundays from 9am to 11:30am. Comprising of Two Breakfast Sandwiches and two Breakfast meals (one of those being vegetarian). 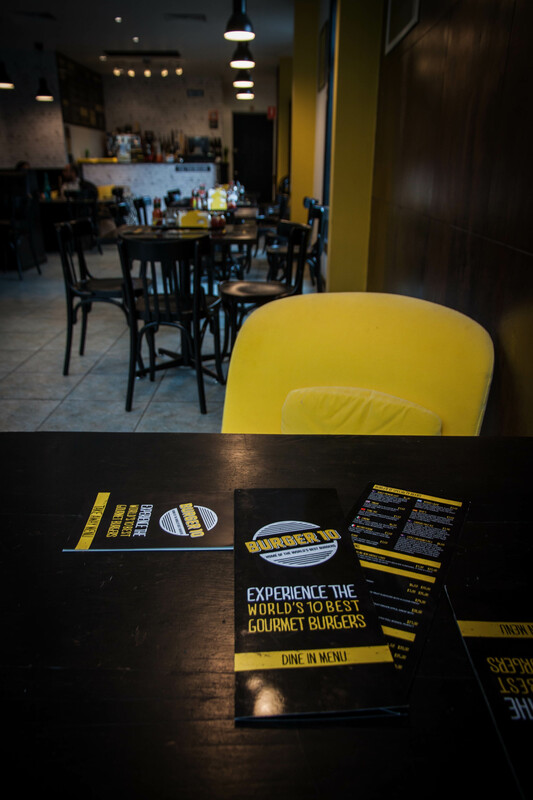 A really great option for those wanting a well-made, high quality, interesting and damn tasty burger I wouldn’t hesitate to recommend Burger 10. Definitely one to keep filed away for future reference. 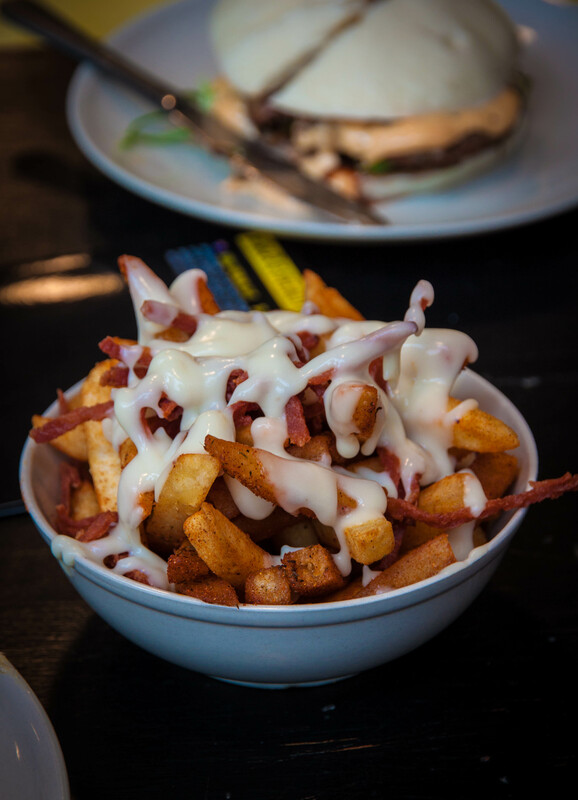 the Cajun spiced smoked crispy potato fries with Bacon & Cheese Sauce sounds marvellous!